Trips and slips are a common form of workplace injury, leading to a range of injuries from minor to life-changing. It is the legal requirement of employers to take steps to prevent these accidents from occurring. Use our trip and slip signs, in conjunction with your own risk assessment to highlight the dangers present. Ensure your slip warning signs remain securely displayed. We stock a range of sign fixings, including adhesives, tapes and screws. If you cannot find the message that you need within our vast range of safety signs, then why not design your own sign. Steep steps, slippery surfaces and wet floors are just some of the common trip and slip hazards found in workplaces. Using trip & slip hazard signs can alert everyone to the danger, encouraging them to take greater care or to avoid the hazard altogether. The use of anti-slip flooring, stair treads and stair nosings can help to further reduce the risk of a slip or trip at work. In addition to wall signs we also offer floor signs that are quick and easy to apply, are non-slip and can help you to highlight any potential slip or trip hazards. The range of slip and trip warning signs at Seton is comprehensive, and most signs are available in a variety of options to suit different environments. Choose the sign that best suits your requirements, and select from an array of different materials; including high quality metals and plastics. We have available signs that are suitable for both indoor and outdoor use. For extra-durable safety signs consider choosing a sign that is water, UV and solvent resistant, or even vandal-resistant for use in particularly demanding areas. 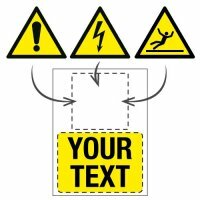 All of our trip and slip hazard signs feature the well-known hazard triangle with an EU legislation compliant pictogram giving further information on the nature of the trip, slip or fall hazard. The signs also feature clear wording describing the general nature of the hazard. Because the areas can change where trip and slip hazards often occur, you may prefer to opt for a temporary sign that can be used as required. For example, temporary floor signs warning of a wet floor or cleaning in progress are ideal for this. They fold flat for convenient storage but can be quickly accessed and set up in the event of, for instance, a spillage. Accident prevention is a key part of a good health and safety procedure, and these trip and slip hazard signs can go some way to preventing those accidents. However, whilst the risk can be significantly reduced, it is impossible to eliminate altogether. In the event of a trip, slip or fall, prompt first aid treatment can do a great deal in reducing the severity of an injury. Make sure that your first aiders have everything they need to assess and treat injuries as well as recording any incidents for future health and safety risk assessments. Hazard warning signs are an essential part of health and safety procedures and help employers fulfil their legal obligations to protect their workers from accidents. Many of the regulations surrounding health and safety can be confusing, but by shopping with Seton, one of the UK’s leading suppliers of workplace safety equipment, you can feel confident that every product you purchase from us complies with current UK and EU legislation. Preventing accidents will do a great deal to provide reassurance to your employees that their wellbeing is taken seriously, and can even help to improve workplace efficiency. Clearly displayed trip and slip hazard signs and informational posters are an effective step that you can take to achieve this. If your premises need a trip and slip sign that is not currently in our range, then consider creating your own sign that is unique to your business. We offer a variety of both custom floor and wall signs. 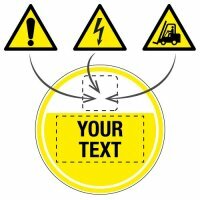 These signs can convey the precise information that you want while still conforming to the required health and safety standards and BS EN ISO legislation governing the use of symbols on safety signs.